West Sunshine development, The Royal, will commence construction in early 2015 and add a new dimension to one of Melbourne’s fastest-growing regions. Within 12 kilometres of the CBD, West Sunshine is the gateway to popular regional cities Bendigo and Geelong and is one of Melbourne’s priority growth centres, making it ideal for forward-thinking buyers looking to net a prime piece of the up-and-coming area. Three Pillars has answered the call with its new 97-allotment project, The Royal, on the banks of Kororoit Creek. 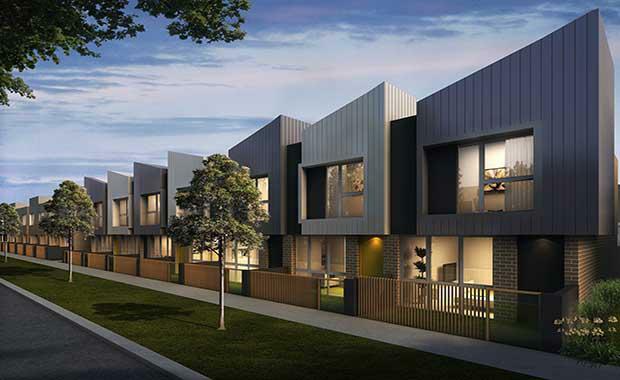 Consisting of single- and double-storey low maintenance turnkey townhouses, The Royal will offer space for growing families at an affordable price. The first of three stages was launched at a family fun day on 9 November 2014. The event featured free food, live entertainment, a jumping castle, animal farm and specialty Vietnamese rice cakes called Bánh Chu’ng, and was attended by about 250 local residents. Stage 1 includes four two-bedroom homes by respected builder Edgepoint Homes, priced from $391,000 for 158.7 square metres and seven three-bedroom homes, priced from $511,000 for 198.13 square metres. According to Three Pillars Director Tom Hoogenbosch, The Royal, which has been conceived by one of Australia’s leading architecture and interior design practices, dKO Architecture, is visually striking with a modern aesthetic, clean diagonal lines, contemporary facades and customisable interiors in a range of colour schemes. “We think The Royal sets a new standard for the area,” Mr Hoogenbosch said. Cleverly devised floorplans will offer open-plan living and gallery-style kitchens with Technika stainless steel appliances and tiled splashbacks. Other features include six-star energy ratings, Chromagen gas-boosted solar hot water units, secure garage parking and large master bedrooms with walk-in-wardrobes. Surrounded by lush landscaping that includes a range of native and exotic plant life, each home will be serenely positioned alongside its own private garden and will have easy access to nearby Buckingham Reserve, which is one of five flagship parks developed by Brimbank City Council. The Royal is also within easy reach of West Sunshine’s sporting amenities and medical and educational facilities, and residents will benefit from ample public transport options, including Sunshine train station, which is one kilometre away. With limited opportunities for quality residential land available in West Sunshine, there has already been a considerable level of enquiry among local homebuyers and investors.